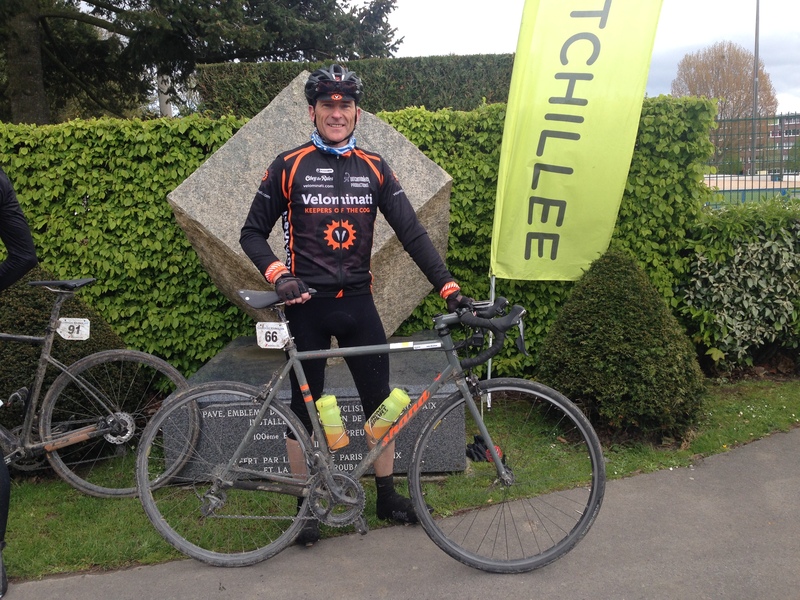 Having been the successful bidder for the Hotchillee Dunkerque Roubaix 2016 event in the open auction at the 2015 Braveheart Cycling Fund dinner JB made the long drive via the Channel Tunnel (what a great facility that is) to the Quality Hotel, on the outskirts of Dunkirk, Northern France. After a swift visit via a Calais wine warehouse… to use up the space in the boot under the bike you understand… The Shand Skinnymalinky was unpacked and a swift ride out in club kit ensued to check the set up of the GoPro under the bars and my lungs and legs after 3 months of respiratory misery. The event dinner that evening was a hoot. Part of the Braveheart deal was that I also got a seat at the top table with the stars and guests. In the previous 2 editions Geraint Thomas was the main attraction but this year he was topped by cobble riding ‘legend’ Kenny van Vlaminck resplendent in Top Bonk Schleppers team kit and flip flops. If you haven’t seen or heard of him, check out on Google/ Youtube. 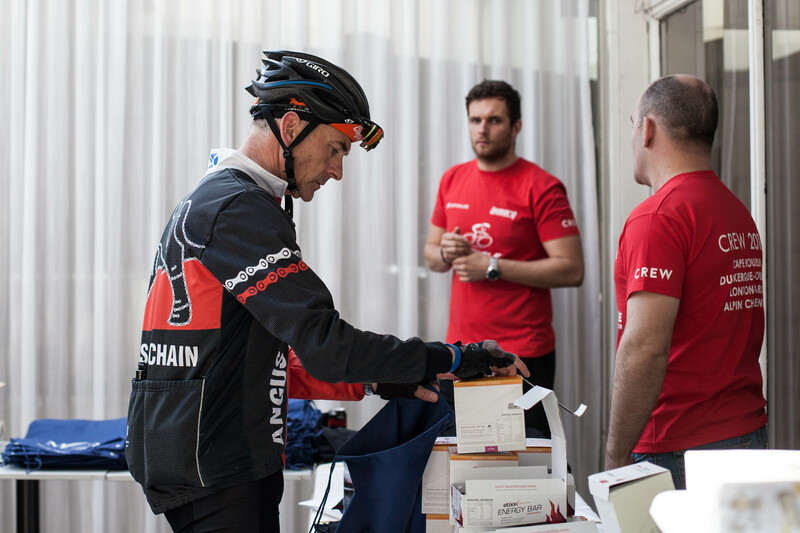 I also had the privilege of sitting across from Stephen Roche and Simon Jones, ex GB Team Coach and now Head of Innovation at Team Sky (that role is a lot more than boss of marginal gains as I found out in our discussions). 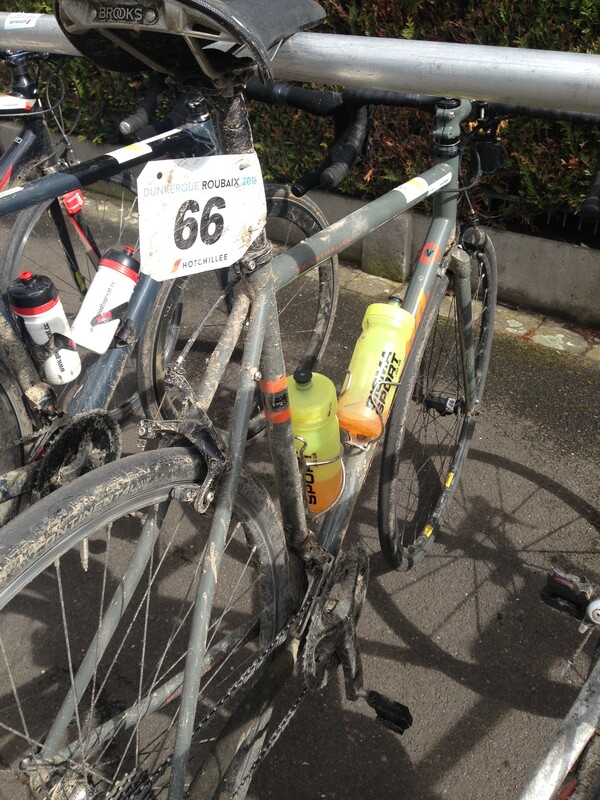 His own innovation for this weekend was to bring Ian Stannard’s Roubaix 3rd place bike for another outing on the pave. 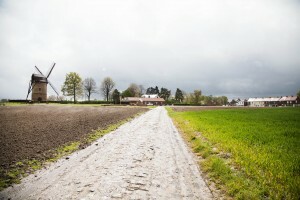 We set off, 95 km of flat smooth wet tarmac ahead before we were to meet any rough granite! Each group had lead and follow cars, medical support and motorbike outriders working a rolling road closure. After nearly 3 hours in persistent rain, never have I been so glad to see 10% gradient signs (twice in quick succession) as we turned north for a short excursion over the border into Belgium and did an extra loop while an injured rider was whisked away in the event ambulance. I never did find out what happened. 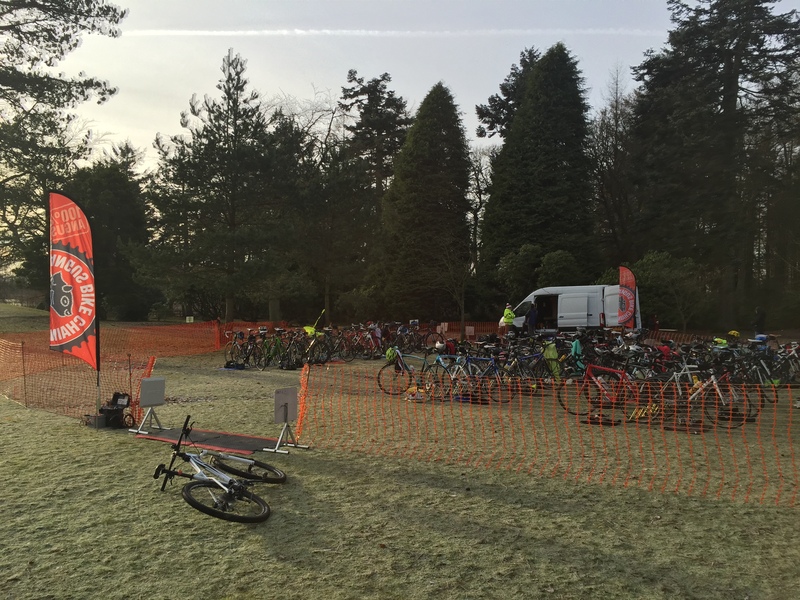 At last a chance to get the heart rate out of the 100 and teens to something that might get warm blood to my extremities after nearly 3 hours! We had one sector of cobbles to face before lunch, a mere 2* according to the sticker on my top tube but that came with a warning from the road captain that it should be at least a 3. I hit it in the wrong gear, hands on the hoods and as we all went for it on the crown an over enthusiastic lady passed me on my left, turned up onto the crown and was promptly dumped onto her face and chest by the wet pave. Ouch! She got back up though and this spill didn’t dampen her enthusiasm one bit! The vibration through my arms was something else but what a feeling when you hit smooth tarmac again – it’s like electricity slowly fading and leaving tingling behind. Incredible. Lunch followed where I spent most of baguette time stripping out of wet kit, putting on clean and dry kit putting the the damp back on top. 2 pairs of shorts and gloves was never my aim but needs must. As soon as we started some serious sleet and hail hit us sideways just to make sure all new layers were soaked through in quick time. 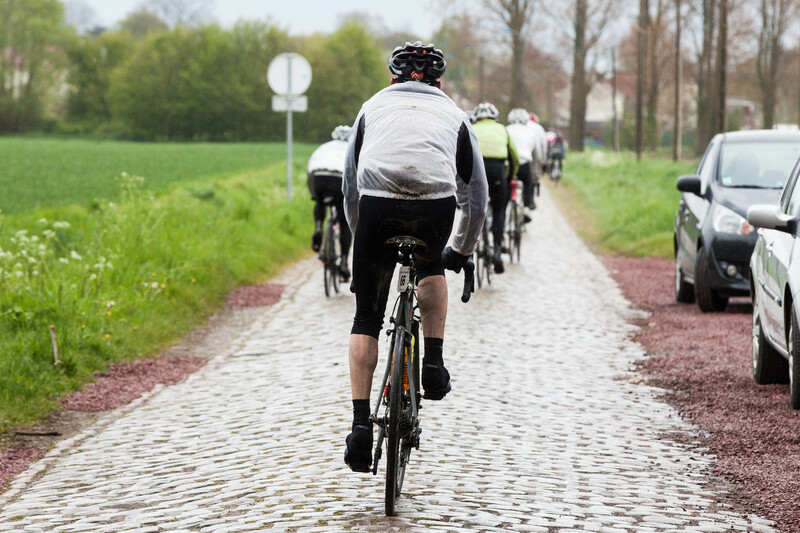 There followed in the next 70k another 8 sectors of pave including the famous Carrefour De L’Arbre. Cramping quads and hamstrings from 3 months of little serious training had hit hard at 120km but an all over body massage from another couple of sectors back to back saw that disappear. By then I was getting the hang of riding the crown, hands on the tops and turning a bigger gear. I’d like to say fast but that’s all relative. After the Carrefour the 100+ riders regrouped and rode pretty much together towards Roubaix, and eventually into the famous outdoor velodrome. I tried the banking but was a little apprehensive of the smooth concrete having been told on the approach of a serious pile up last year by a group who tried to tackle the bankings wet and put each other into hospital! By lap 2, I was happier to say up on the stayers line at speed and ride across the line. Job done and in one piece. Just as well, who was going to drive me home? I had already been told that Mandy was not driving south if I could’t get myself home. A beer or two while watching the closing km of L-B-L followed the hot shower in the concrete riders shower stalls, each changing area named after a previous winner. Enjoy was not a word that was uppermost immediately after the event, but reflecting back and especially watching some of the GoPro footage over the pave, I’m happy to use it now. How time fades the pain of cold hands and even worse, blood returning to cold hands! The Skinnymalinky with 28’s on the Hope hubs and 32 spoke Open Pro rims was faultless. Lower tyre pressures helped a lot as did the Brookes Cambium saddle. Overall it was responsive, planted, assured and swift over the worst these surfaces could offer up. Roll on 2017, it has to be Flanders and maybe the full distance Paris Roubaix sportive and not just 11km of pave in 170km. If only I can get a decent winter of training put together! 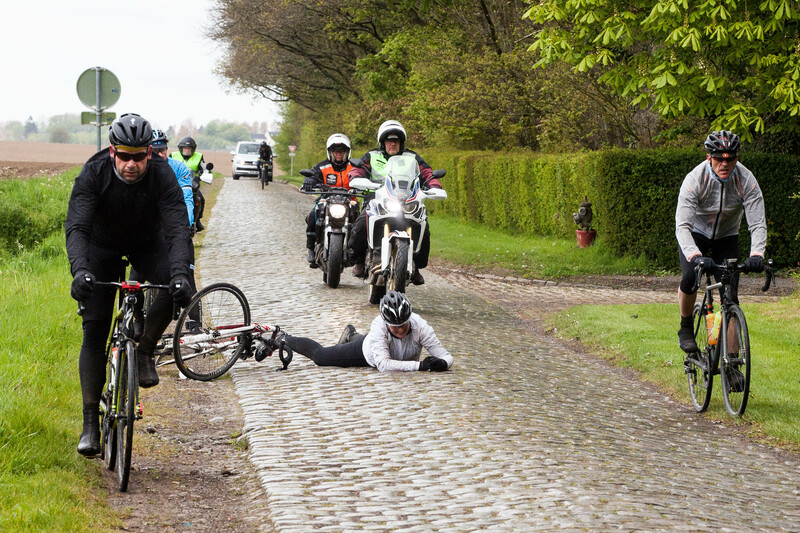 Some of the better photos here were taken by the official photographer Jojo Harper, particularly the one of the crashed rider. She was in the right place! Always bring the rain bag whatever the forecast! Thought you’d know better JB, great write up, looks brill.